The Bond and Money Markets is an invaluable reference to all aspects of fixed income markets and instruments. It is highly regarded as an introduction and an advanced text for professionals and graduate students. As a reference book for students studying for Business and Finance related postgraduate degrees; MBA students; masters of finance students; those studying for professional qualifications such as CFA, ACT, IIMR, ACIB, Securities Institute, ACCA. Foreword; Preface; Introduction to bonds - Intro to bonds; Financial market arithmetic; The pricing of bonds; Bond yields; Review of bond market instruments; The yield curve; Price, yield and interest rate risk I; Price, yield and interest rate risk II; Price, yield and interest rate III; Price, yield and interest rate IV; Government bond markets - The gilt market; The US treasury market; International bond markets; Corporate debt markets - Corporate bonds I; Callable bonds and OAS analysis; Convertible bond markets I; Convertible bond markets II; The Eurobond market I; The Eurobond market II; Warrants; MTNs; Commercial paper; Prefs; US Municipal; Asset backed bonds I; Mortgage backed bonds II; Asset backed bonds III; High-yield bonds; Credit analysis; The money markets - Money markets; Capital and regulatory requirements; Asset and liability management; Repo; Money market derivative; Risk management - Intro to risk; VaR; Fixed income modelling; Derivative instruments - Swaps I; Swaps II; Bond futures; Options I; Stochastic processes; Option pricing; The binomial model; Bond option models; The Greeks; Strategy and uses; Exotic options; Trading and hedging - Trading and hedging; Advanced fixed income analytics; Modelling; Yield curve modelling I; Yield curve modelling II; Estimating and fitting the yield curve; I-L bonds analysis; Pricing long-dated bonds; Portfolio management - International investing; Constructing bond indices; Technical analysis - Technical analysis; Introduction to credit derivatives - Credit derivatives; Emerging markets - Brady bonds; International investing; Concluding remarks. Moorad Choudhry is Chief Executive Officer, Habib Bank Zurich PLC in London, and Visiting Professor at the Department of Mathematical Sciences, Brunel University. Previously he was Head of Treasury of the Corporate Banking Division, Royal Bank of Scotland. Prior to joining RBS, he was a bond trader and structured finance repo trader at KBC Financial Products, ABN Amro Hoare Govett Limited and Hambros Bank Limited. He has a PhD from Birkbeck, University of London and an MBA from Henley Business School. Moorad lives in Surrey, England. Chief Executive Officer, Habib Bank Zurich PLC and Visiting Professor at the Department of Mathematical Sciences, Brunel University. "Moorad is a master of his subject. He is a rare financial markets author, in being both highly readable and yet still informative to practitioners. The academic will find a lot to admire in this comprehensive and lucid guide. The reader will come to treat this book as his bible." - David Wileman, CEO, King & Shaxson Bond Brokers Limited, Old Mutual plc. "Moorad has written an excellent handbook on fixed income markets. It provides a broad ranging practitioner"s guide to all instruments and trading approaches that make fixed income an exciting market." - Jan Loeys, Global Head of Fixed Income Research, J.P.Morgan & Co. "The Author writes very lucidly on fixed income issues and combines mathematics and text very effectively. I found the chapters interesting and easy to read." - Dr Stephen Satchell, Fellow of Trinity College, a Reader in Financial Econometrics at the University of Cambridge, and Visiting Professor at Birkbeck College, City University Business School. 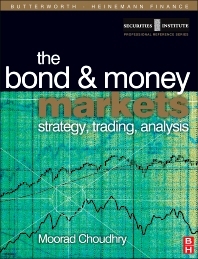 "In the "Bond and Money Markets", Moorad Choudhry has managed to combine the clarity of explanation vital to students of the subject with sufficient content and detail to ensure that even the experienced practitioner will find this book an invaluable asset. To have covered such a complex area so effectively within one reference book is a notable achievement, to have done so with such obvious enthusiasm only adds to the excellence of this work." - Martin Barber, Partner, Financial Services, KPMG Consulting. "A fantastic achievement and set to become the premier reference on global debt capital markets. Written in the author"s trademark accessible style, this is a superlative and enthusiastic contribution to the financial economics literature." - Daniel Shakhani, Global Credit Strategy, Goldman Sachs International. "After spending a lifetime reading dry prose in capital markets texts, this is like a fresh breeze from an author with knowledge and experience. The conversational style, real worked examples and excellent illustrations make the understanding of complex issues very easy. In my opinion everyone from market professionals to market novices will find something of great value in this book, and most will end up with a well thumbed copy." - Pantea Rezaifard, Vice President, Corporate and Sovereign Trading, Merrill Lynch.